A French father helps young Washingtonians understand true freedom. Washington, D.C. — It was a frigid night on K Street, among the law offices and lobbying shops, just a stone’s throw from the White House itself. The house was packed – literally, it was standing room only. Had it not been a continually cooperative group, willing to push on in, the audience would have extended past the door. And all those people weren’t there for a fundraiser or a meet-and-greet with the hot politician of the hour. They were there to hear about freedom. What’s so different about that? You may ask. Freedom of speech. Freedom of religion, whatever one means by that — it’s in some dispute just now. Sounds like the sort of thing Washington talks about. On this night the topic was “Interior Freedom.” The speaker was a French priest wearing the traditional white habit and brown scapular. And he wasn’t even speaking English. In the last days of the Christmas season, the Catholic Information Center crowd was happy to wait for the sister who would be translating. #ad#It was a young crowd. I could have taken the headcount of the over-50s on one hand, two at most. The audience was largely familiar with Father Jacques Philippe from his many books on the spiritual life. Interior Freedom is one. Searching for and Maintaining Peace is another. Both grow out of the work of a lifetime. As Pope Francis is fond of saying: God is patient with us. So go to Him already! This is the stuff of not a feel-good but a rigorous spirituality, real discernment. This interior-freedom business is key to getting the rest of those freedoms right. They all rely on people who care about the habits of virtue to keep things going well. On New Year’s Eve, Supreme Court Justice Sonia Sotomayor surprised many by issuing an injunction to relieve the Little Sisters of the Poor — a Catholic congregation of women religious who care for (as their name suggests) poor elderly men and women — from the coercive abortion-drug, contraception, sterilization mandate issued by the Department of Health and Human Services as part of Obamacare. But for Sotomayor’s injunction, the Little Sisters would have been hit with the mandate the next day, January 1. This Obama-administration mandate forces Americans who are morally opposed to some or all of these things to either ignore their conscience or face steep financial penalties that needn’t and shouldn’t exist. But government isn’t the beginning and end of public life. We have charity in America. We have neighbor looking out for neighbor. We have hope when the government fails us and our world seems to fall apart. Among Father Philippe’s most fundamental points is: Don’t go through life expecting from others what only God can give. Security. Happiness. Even love. By which he means what everyone who has been to an Alcoholics Anonymous meeting knows: It’s that faith and hope in something greater than ourselves that sustains. The Little Sisters do what they do because they have chosen to hand their lives over to Providence. It’s a Little Sister’s knowing she is loved by her Creator that gives her the desire and strength to serve. She is bringing the love she knows from God to others. She is able to love because she is loved. In our everyday relationships — and in our politics, too — we too often impose on others the fulfillment of needs only God can provide. And isn’t that the source of so much misunderstanding and conflict? Peace comes from examining this. And daily. Not everyone on K Street is going to buy into this. But at least one young man walked into the auditorium that evening impressed by the scene: young professionals, at rapt attention, packed into the room. “I need to be a part of this,” he said as he walked in. Just as representative democracy needs to be about letting the Little Sisters do what they do as they need to do it. We need that virtue; we need that service. The Founders knew this. Some 300 predominantly 20- and 30-somethings in Washington, D.C., appear to know it too. “Here’s what I know about human beings,” New Jersey governor Chris Christie declared during his much-watched press conference about traffic and scandal on the George Washington Bridge. “I’ve hired a lot of them in my time. . . . Sometimes, despite the best background checks, . . . despite the best interviews, despite your best instincts . . . ,” he started to explain. “Sometimes they start off as a good hire; because of circumstances that happened in their life, they change. You can’t prevent everything. But the test of leadership is, when you find it out, what do you do?” That’s life. We mess up. Someone else does. Some make news. Some cost jobs. Most hurt someone. What are we doing now to move forward? Scandal in whatever form doesn’t happen out of love. Discouragement isn’t born of love. To use your freedom to choose to love, born of faith in an eternal Source of love, can change everything. Like a traffic jam on a bridge, the fog of pride can get us stuck. With freedom, we have the power to clear it up. But know it takes a lifetime. And that we’re in it together. In a Washington crowd, on the GWB, on the job, we are together. Knowing and seeing, living the examined life, helps honest, true freedom flourish. 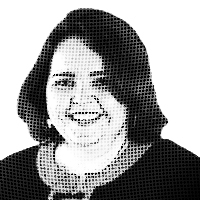 — Kathryn Jean Lopez is editor-at-large of National Review Online, a director of Catholic Voices USA, and a member of the board of the Catholic Information Center. This column is based on one available exclusively through Andrews McMeel Universal’s Newspaper Enterprise Association.